My kids will be out of school in moments to spend the Thanksgiving holiday at home. It is a fun time in my house as we get into it. My husband is Australian and (I believe) loves Thanksgiving more than most Americans who have lived here their entire lives. I think he likes the ritual of the feast that has everything to do with family, friends and enjoying each other. Are you going to enjoy each other? I ask this because I am well aware of a divided country into colors of red and blue. I am not getting political - I am simply pointing out that there is an “us” and “them” and it relates to our views on how best to run the country. The situation is so dire that the New York Times ran an opinion piece called How to Have a Conversation with your Angry Uncle over Thanksgiving. This uncle can be either liberal or conservative but he is always angry. I'm angry about a bunch of stuff but I am planning to keep it all to myself for one day. Hurray for maturity! Let’s say there is someone (an uncle or cousin) at your Thanksgiving that you don’t agree with. I ask you this - can you tolerate that person? Tolerance is all that I wish for my readers. I don’t ask that you agree or even like the person on the other side but we can tolerate each other. Perhaps we can look at each other, pass the potatoes, and agree to love stuffing or hate cranberry sauce and that is enough. 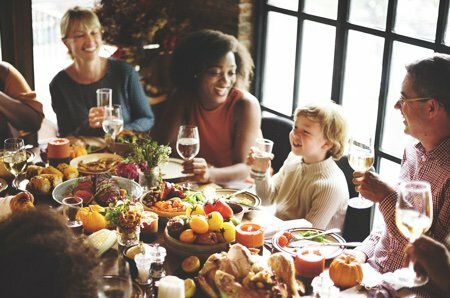 Food can bring people together and Thanksgiving is about sharing food in our homes with our collective tribe. Who can't get on board with that? I hope you all have a lovely meal with family and/or friends and feel a moment of harmony on Thursday (even just a moment is something). In our family, politics is declared off the table for Thanksgiving, Christmas, and any kind of reunion dinners. Especially if it is in my house. They can argue with each other as much as they want on their own time, but not in my house or at my table. I let everyone know beforehand, and it always works. If mad Uncle Harry starts in anyway, I nip it in the bud. Happy Thanksgiving to you and your family Lisa! And all your many followers too. This year our table of 5 will find themselves at my daughter's home for the second Thanksgiving she is hosting. [We each bring something.] We are all up on the latest and in agreement politically and morally, so other than a ''yeah I heard'' we don't need to talk politics. Stick a steaming mug of mulled cider in our hands, and the ooohs and ahhhs start a cheerful din of great holiday memories we've shared. We could all use another TG around March, don't cha think ? Lisa, Happy Thanksgiving to you and your family. What a lovely reminder to practice tolerance. You're so right - we don't have to agree with everything to tolerate each other and enjoy the day. Thank you. Best wishes for a lovely American Thanksgiving to all who read this! Happy Thanksgiving to you and your family! I love your comments! Hurray for maturity indeed. Happy Thanksgiving everyone! Thank you Lisa, it's wonderful how much you care about your readers. Happy Thanksgiving to you and yours! Happy Thanksgiving to you and your family. My husband and I are having our son, his wife and her family here at our retirement home cottage. We are having the turkey and all the trimmings done by our catering department with every adding their favorite sides. I will be making cheesecake bars for dessert. We have been doing this for the last 6 years. I appreciate your columns very much.Happy Thanksgiving to your and your family. and most of all...Be Kind. Clear boundaries are usually appreciated by all and make it possible for a couple of hours when we remember what we're there for - grateful for families, friends, neighbors and fuzzies. Whether we're at the Food Kitchen volunteering or at home with the fuzzy or at the table with 10 people, gratitude is a good daily attitude and skill. Thanks, Lisa, for the bagged turkey notes. Already made it and my husband loved it. I'll be taking veggie enchiladas and beans to our kids, so whatever way you all mark a day of thanks, enjoy! Thank you, Lisa! If only everyone would practice tolerance, and strive to compromise on our differences--what a better place this country would be in. Thank you for caring and Happy Thanksgiving! Never using a cooking bag for the turkey again!I've had crispy skin when my brother cooks his bird in a bag. I've had crispy skin when cooked in the bag - but the oven I'm using now? It can't be 350 degrees. It's a newer energy efficient stove. yet pale flabby skin and thigh temp at 160 after 2 full hours. put it back in for another 20:-( In just read your old post on bags...never again! everything else came out lovely tho!